If smaller means better, then the ACULON Rangefinder is at the top of its class. With its ultra-compact size (3.6”x2.9”x1.5”), this new rangefinder redefines “portability” and is small enough to rival most smartphones. Its palm-sized dimensions make it comfortable to wear around your neck or fit in your pocket. 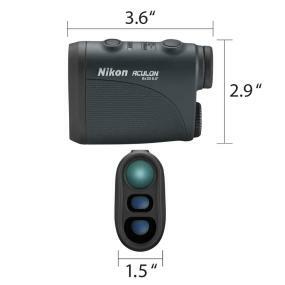 And because it weighs just 4.4 ounces (without batteries), the ACULON Rangefinder is so light you’ll hardly even notice it’s there. 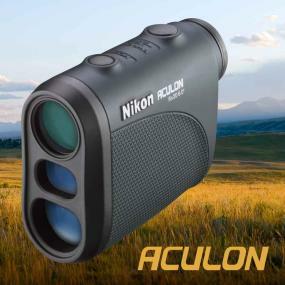 Operating the ACULON Rangefinder is intuitive and requires just the simple push of a button to get an instant distance reading. When the button is held down, the rangefinder gives a continuous measurement for up to 20 seconds as you scroll across the visible area. The display is uncluttered and free of any unnecessary obstructions so you can concentrate on the object you’re ranging. The ACULON Rangefinder automatically powers down after eight seconds of inactivity. 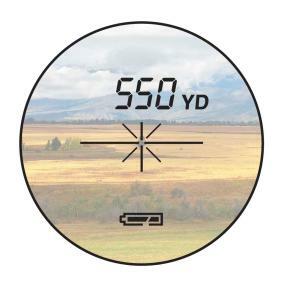 The ACULON Rangefinder is programmed in Distant Target Priority Mode – meaning that it will display the range of the furthest target amongst a group of targets measured. This is particularly useful if the object being measured is partially obscured by grass or brush. 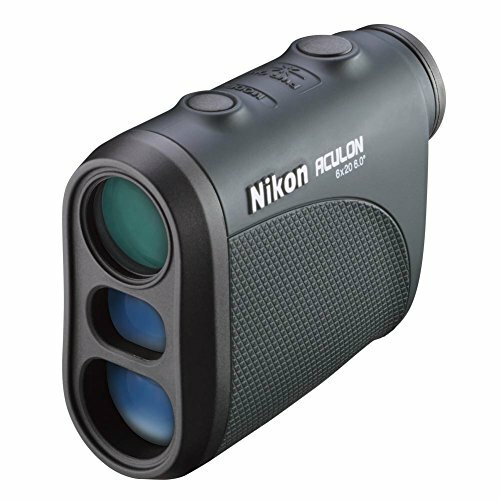 The ACULON Rangefinder has 6x magnification and a 20mm objective lens. It features long eye relief (16.7 mm) and is engineered using Nikon’s multilayer coated optics, which provide an even higher light transmittance across the entire visible light spectrum. This minimizes the loss of light due to reflection, thereby ensuring a more natural, clearer view. Speed is a virtue in which the ACULON Rangefinder excels. As soon as you push the button, it delivers an accurate reading from six yards all the way out to 550 yards. Measurements are easy to read and are displayed in 1 yard/meter increments. When seconds count, you’ll have an instant reading with a precision that you can rely on.